PETALING JAYA: The Health Ministry has urged all snake bite victims to seek help at the nearest emergency department or healthcare centre even though Malaysia has more non-poisonous snakes than poisonous ones. "The doctors working in the emergency department will decide to administer antivenom according to the severity of the effect of the poison: the speed of its spread or its systemic manifestations or effect to the limb," said the ministry's director general Datuk Dr Noor Hisham Abdullah in a blog post. 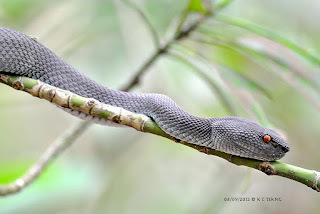 He said that there had been a surge in the reporting of snake bites as a result of the unusually hot weather conditions the country is facing now. Nor Hisham added that identification of the species of snake is crucial for doctors to administer specific anti-venoms. "On most occasions, we are unable to identify the actual snake species that has bitten a victim as it usually slithers away. Actual snake identification allows the emergency doctors to administer specific anti-venom for the species," he said, adding that it is dangerous to capture snakes and it should be avoided. He said that potentially dangerous snakes in Malaysia are the Malaysian Pit Viper, the monocle cobra, the Shore Pit Viper, Waglers pit viper, banded krait, Malayan krait, the coral banded snake and the King Cobra. Noor Hisham said symptoms in snake bite victims includes - pain, headaches, vomiting, blurring of vision, and paralysis of the eyelids or the breathing muscles, loss of consciousness, bruising, severe swelling, bleeding and muscle tissue breakdown. He said a multidisciplinary and inter-ministerial team of experts formed by the ministry is currently working to produce the MOH Clinical Practice Guidelines (CPG) for Snake Bite which will likely be out later this year. Noor Hisham also said that victims and bystanders should call 999 immediately in case of a snake bite.